So what does union with Christ have to do with the church? Does it have a corporate expression or is it solely an individual benefit? In a nutshell: union with Christ teaches that we were not only created for oneness with God but also oneness with one another. No doubt, Jesus came to first unite us with Himself and then God the Father and Spirit (John 14:18-23; 15:4-7; 17:20-25). But his salvific work extends to create oneness with other Christians too, as we are joined together to Christ (Ephesians 2:11-22). This passage teaches us two things about spiritual fellowship with Christ. First, the life of God is found in the soul of man through Christ (1 John 1:1-2). This “life” – who is Jesus – appeared and the apostles saw it, testified to it, and experienced it firsthand. Second, spiritual fellowship with Christ is shared relationally in the church (1 John 1:3). Thus, union with God through the Son makes union with one another possible. Think about it this way: the apostles did not preach the gospel so that there would be a new me, but so that there would be a new we. The power of the gospel shows up in the creation of the bride of Christ – a new and royal priesthood, a holy nation, a people for God (cf. Exodus 19:1-6 with 1 Peter 2:9-11). The Church, not just individual Christians, is one with Christ. This leads us to two more passages for consideration. In 1 Corinthians and Ephesians, the Apostle Paul used the body metaphor to encourage church unity. He taught them that they are the body of Christ and that each one is part of it (1 Corinthians 12:27). He spoke of Jesus’ blood making peace between Jew and Gentile, fashioning the two into one new man in his body (Ephesians 2:14-16). The nature of this body metaphor connotes incorporation and identification of God’s people with Christ. It denotes a close relationship and communion between Christ and his church, and between members of the Church. Now that we have established the theological import of union with Christ for the local church, let’s consider some applications. Let me drop this doctrine in on my own life as see what we get. Sometimes I come home from a long day of work with a sinful, grumpy attitude. Now and then I complain (to myself if I’m smart) about the dirtiness of the kitchen or the mess in the living room or the pile of laundry on the bed. What has she done all day? (Remember: sinful attitude). But union with Christ teaches me that I am one with my wife through Christ and uniquely united to her in marriage. Therefore, that’s not just her mess; it’s our mess! Not only should I be more compassionate, but I should find ways to help her accomplish these tasks. I enjoy spending time with my family, but also relish the opportunity to get away with the guys. Some days or weeks when I am frequently away I notice my wife is overwhelmed and somewhat withdrawn from me (shocker!). Union with Christ challenges my selfishness! Being united to one another in Christ compels me to love my wife and live out of our marriage union. This means that my time is actually our time. Of course our oneness with Christ and one another can be applied broadly to the local church, not just in Christian marriage. Do you ever feel jealous towards a brother who has been blessed with success, be that financial or ministerial or vocational or relational? Rather than competing with that brother, enjoy his blessing as your blessing. His joy can be your joy, because you are one in Christ! The church is messy. It’s made up of broken, sinful people who live amidst broken, sinful circumstances. You may be tempted to withdraw from a sister who is hurting terribly from a crisis. I just don’t have time to care for her, you tell yourself. I’ll pray for her and hope someone else will get to her. I have other things to do with my time. Union with Christ challenges this notion! It tells us to get into the mess with her. It pushes us to weep with her. Because you are united through Christ to her, her mess and pain is your mess and pain. You see, union with Christ pushes us to feel a brother or sister’s pain and joy as if it were our own. Paul in 1 Corinthians 12:26 says something similar: “If one member suffers, all suffer together; if one member is honored, all rejoice together” – which is another way of saying that Christian empathy is rooted in our oneness with Christ. Could this thinking be what unlocks a new level of love and compassion for Christians in local congregations? It may be easy to picture the local church as made up of a bunch of individuals – individuals who have some things in common but think very individually. This is my time; my money; my resources; my space. But remember, when we become Christians we move from an “I” to a “We.” Therefore, the local church is a single, spiritual entity – an entity that ought to think and act corporately! Our time; our money; our resources; our spaces…for the glory of Christ and the spread of the gospel. Can you imagine that for a moment? What would it look like if our local churches embraced a radical “we”-orientation rather than a culture-shaped “I”-orientation? 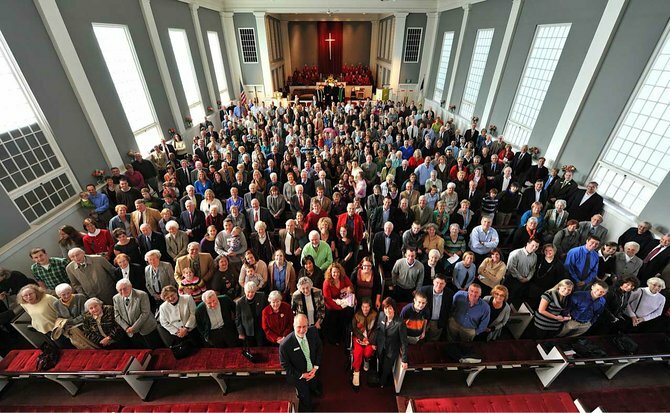 Would we experience a deeper, more profound unity within our congregation? Would Small Groups and Elder boards and Missions committees function more effectively? Would congregants absorb and bear up with more bites and offenses? Would more members move towards each other with compassion and empathy? And would the world be powerfully drawn to God’s unified family, a concern that Jesus himself once prayed for (John 17:20-25)? Finally, union with Christ teaches us that it’s not our efforts that create congregational unity. God has already created unity by joining together individuals to Christ. Unity then is a precious gift, to be received and cherished! We don’t need to conjure unity up from nothing, as if the whole thing depended on prayer meetings or Peacemaker workshops or World-wide church councils (all good things). Rather, our job is to eagerly “maintain the unity of the Spirit in the bond of peace” (Ephesians 4:3). May the Lord grant us the strength to do just that: prize the gift of our corporate union with Christ, and then eagerly maintain it for the sake of gospel life and mission! Father, thank you for not only saving us from our sin and from your wrath, but for also saving us into a new life with a new family, the church. May your Spirit empower us to fight against the strong, I-focused current of today. May your Spirit show us the wonders of the gospel of oneness, which pushes us to sacrificially love those with whom we are joined together in Christ. Amen. Henry Scougal, The Life of God in the Soul of Man (Ross-shire, Scotland: Christian Focus Publishing, 1996), 40-41. Thabiti Anyabwile, The Life of God in the Soul of the Church (Ross-shire, Scotland: Christian Focus Publishing, 2012), 9. Anyabwile, The Life of God, 18. John Jefferson Davis. Meditation and Communion with God: Contemplating Scripture in an Age of Distraction (Downers Grove, IL: IVP Press, 2012), 113. Psalm 40: What do you do when you’re in the pit? The first time I heard the words to Psalm 40 was not in a sermon or a Bible study. It was from the lips of U2’s Bono. U2 put the first three verses of this psalm to song in “40” on their album War. I learned it in church before I was a Christian in fact. (You can watch a live version of “40” at the bottom of this post). These verses present a beautiful picture of God’s deliverance. David lies in a pit which will destroy him if left alone. It’s like a miry bog – a muddy, sticky place. In other words, David is stuck! His movements are limited and he can’t get out. And he desperately needs help. There is no indication that this was a particular historical situation for David. Of course we can recall many times when David was stuck and hurting and needed God’s rescue, whether that’s when King Saul was hunting him or years later when his son Absalom was trying to kill him. Maybe you feel stuck in life right now. Maybe you feel trapped and unable to make progress with Jesus. As if your feet are trudging through thick, sticky mud and you can’t get to where you need to be. Or you’ve fallen into a pit and you’ve tried to claw yourself out. But it’s just not possible. We’ve all been there. It might be the pit of debilitating depression, that sort of nagging, endless sense that we can’t go on. It might be the muddy bog of bitterness from a painful relationship. It might be lingering disappointment over dashed dreams. Maybe we’ve fallen, yet again, into the pit of our besetting sin, a pit we have created for ourselves. We wonder, will God help me even now? What do you do when you’re in the pit? And what will God do for us when we’re in the pit? Let me point out 3 things we can do. (In the next article I will reflect on 4 things God does for us). #1 Remember. Notice that all of the verbs in these verses are past tense (I waited…he inclined…he drew me out…). David is remembering a season when God pulled him out of the pit. Remembering is a powerful practice. Notice David doesn’t just remember vaguely, he remembers specifically. He remembers the painful experience of pit life, the crying out, and the waiting. And he remembers specifically the movements of God’s grace – inclining, hearing, drawing out, setting upon, giving a song. If you’re in the pit, can I suggest to you this particular practice? Remember specifically a season when God cared for you. Journal about it. Thank God for it. Talk to a friend or spouse about it. Write a song to convey it. 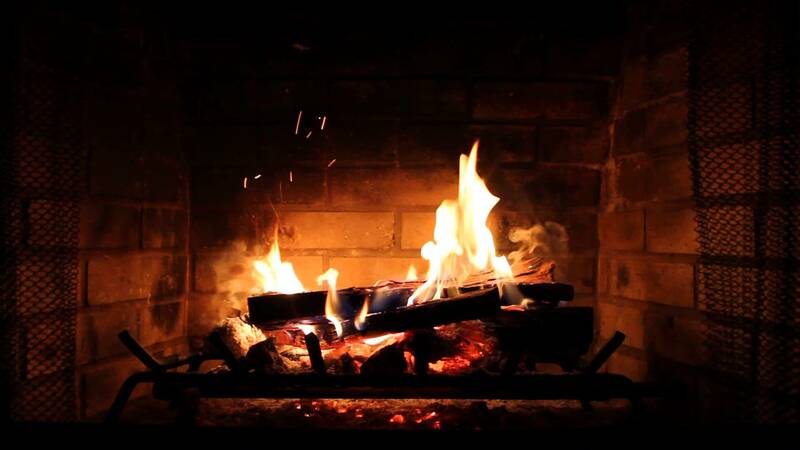 Set aside unhurried time to linger in God’s presence as you consider his past faithfulness. Don’t rush this. Learn to remember, because without it you may sink further into the mud. Remember too the ultimate pit of destruction that God has pulled you from. Through Christ, God rescued us from the pit of sin and wrath that we all found ourselves in. His death and resurrection guarantee that repentant sinners can escape this pit and find sure footing all the way to the Promised Land. And friends, if God can pull you out of that devastating pit, he can surely pull you out of your little pits along the way! So remember the big pit and all the little ones afterwards that God has rescued you from. Let these specific remembrances fuel your faith as you wait for YHWH to deliver you. #2 Cry out. In the pit David humbly cried out to God. Sometimes we think it’s unspiritual to lament to God about our difficulties. Sometimes we believe that if we truly trusted God then we would not lament. After all, God is sovereign, we tell ourselves. So this pit of ours is according to his plan! God will work this out for the good. Well, that’s all very true. But last I checked we are all still human! The Bible never calls us to be anything other than human. And in our humanity we hurt sometimes. Expressing this hurt to God isn’t necessarily sinful communication; it can come from a very deep place of trust in our Father’s tender care. Kids who scrape a knee and then bury their tearful faces in mamma’s lap communicate profound trust in mamma. Likewise, God’s children run to their Father when they hurt too. This is child-like trust, not godless defiance. But Godwin, doesn’t the Bible teach that it’s wrong to grumble and complain? Yes it does (see Philippians 2:14). Grumbling is indeed sinful, but groaning is not. Grumbling rebels against God’s hand and arrogantly believes God’s rule is inadequate. Groaning accepts God’s hand while humbly crying out for relief. Learn to groan in the pit, but never grumble! Another angle on this: one-third of Psalm hymnal could be classified as laments! That is truly remarkable. One out of every three songs in the very first worship book express groaning to God. Much like praise and thanksgiving, lament is an important prayer in our arsenal of godly expression. Don’t neglect it! You’ll need it when you find yourself in the pit. #3 Wait. The first three words of Psalm 40 often given me pause: I waited patiently. No one likes to wait for anything – whether it’s waiting for a cheeseburger or waiting to use the restroom. Most situations of waiting aren’t so bad. But waiting patiently for relief from chronic pain? Waiting patiently after your best friend throws a grenade in your relationship? Waiting patiently for the next cancer scan? Waiting patiently for a job as you barely scrape by? Waiting patiently for the grief to subside? But Godwin, what do I do as I wait? The lesson here is more of an awareness and acceptance than a new action. What you do is remember and cry out to God and cling to him and his people as best you can. In doing that you will have enough wind in the sails to keep going another day. 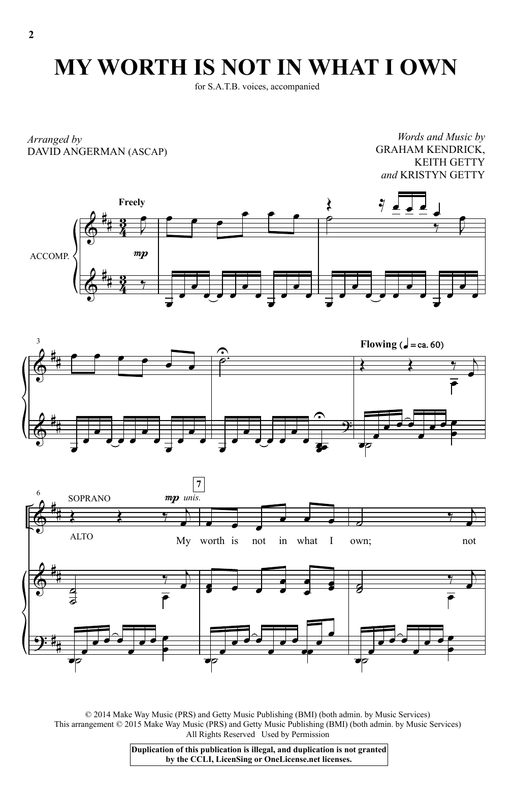 Graham Kendrick, along with Keith and Kristyn Getty, wrote “My Worth is Not in What I Own” which has recently become a favorite of mine. I’ve wondered what went into putting this song together, as it is not only theologically robust but heartfelt and personal. Too few songs nowadays offer that! Well, here is the story of “My Worth is Not in What I Own” in Graham’s own words (and below that a video of the Gettys performing it). “Lyricists are always on the lookout for a big idea, a concept or phrase that might just have a song hidden inside it. Like the sculptor running their fingers over a rough block of marble and laying out their tools, or a potter feeling the weight and texture of a fresh lump of wet clay, the imagination has to see something that doesn’t yet exist.